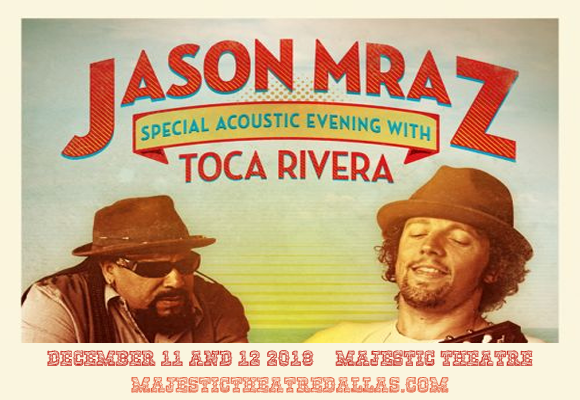 Multi-platinum-selling, Grammy Award-winning singer-songwriter Jason Mraz comes to Majestic Theatre Dallas on Tuesday 11th December 2018 as part of his Live In Stereo Tour! The tour sees Mraz teaming up with expert percussionist Toca Rivera for a stretch of intimate acoustic performances of songs from his incredible career, including from his brand new album, Know! The tour also features special guest Gregory Page! Jason Mraz's career began on the local San Diego coffee shop circuit in 2000, where he built up a loyal local following. He self-released the live acoustic album Live at Java Joe's in 2001, which led to him signing with Electra Records later that year. Mraz enjoyed instant success with the release of his 2002 debut album, Waiting For My Rocket to Come, which peaked at number 55 on the Billboard 200 and went platinum, also launching his first top ten single, "The Remedy (I Won't Worry)". Mraz's sophomore album, Mr A-Z (2005), peaked at number 5 on the Billboard 200 and sold over 100,000 copies in the US. His following album, We Sing. We Dance. We Steal Things (2008), reached number 3 in the US, UK and Australia, giving Mraz his first taste of international success. The album launched the single “I'm Yours”, which peaked at number 6 on the Billboard Hot 100, giving Mraz his first top ten US single, and spent 76 weeks on the chart, which was a record at the time. It was eventually certified seven-times platinum by the RIAA. In 2010, Mraz won two Grammy Awards – for Best Male Pop Vocal Performance ("Make It Mine") and Best Pop Collaboration ("Lucky" with Colbie Caillat). He has sold over 7 million albums to date, and has earned platinum and multi-platinum certifications in over 20 countries. Know, Mraz's sixth studio album, is due for release in 2018.